The UK is committed to a reduction in greenhouse gas emissions of 80% by 2050. Our vision is to develop a portfolio of socially, technically and economically viable systems (‘Integrated solutions’) that deliver heat and cold with high efficiency and enable this target to be met in a cost effective way. We will create a robust roadmap identifying Business, Infrastructure and Technology (BIT) requirements to accelerate implementation and achieve significant end use energy demand reduction both in the near term and to 2050. Delivery Temperature Work Packages (DTWPs) (freezing/cooling/air conditioning, space heating, process heat) will provide exemplar solutions applicable generically in more than one sector (e.g. Commercial and Residential or Commercial and Industrial). We will focus on high volume markets that offer large emission reduction potential to maximise impact. A major part of the energy used in the UK and elsewhere is for heating or cooling. Approximately 16% of electricity is used to provide cooling in the UK. Worldwide cooling is responsible for 10% of all greenhouse gas emissions. In addition, more than 40% of fossil fuels are burnt for low temperature heating amounting to more than 24% of UK CO2 emissions. Even after major efforts to reduce demand by, for example, user behavioural change, optimised industrial processes, improved insulation and reduced levels of infiltration in buildings, there will still need to be a dramatic increase in the energy efficiency of heating and cooling processes through new and innovative technology if the 2050 target is to be met. HOW CAN i-STUTE CONTRIBUTE TO ENERGY DEMAND SAVINGS? Direct combustion of fuels for heat production at temperatures up to 200˚C is inherently wasteful since a range of heat pumping and storage technologies could be used to meet this heat demand with dramatically reduced CO2 emissions. In 2050 it will be essential that energy use for all but medium and high temperature industrial processes be achieved by means of some sort of heat pump system. Present electric heat pump systems have performance far below their potential, but 50% improvements in system efficiency are achievable, as are higher delivery temperatures more compatible with hot water services. Heat driven heat pumps currently offer up to 30% emission savings compared to fossil fuel boilers but 65% is achievable in the long term. In cooling applications, new technologies have the potential to make even greater relative carbon emissions savings and there are opportunities to develop integrated bivalent heating and cooling heat pumps in some end user applications with the potential to reduce carbon emissions by an order of magnitude. The integration of novel heat/cold thermal storage systems is necessary to reduce peak loads / provide a better match with intermittent renewable energy inputs and simultaneously to improve economic viability and system performance. Successful deployment of novel, integrated solutions to provide heating and cooling will require effective policy instruments and regulatory frameworks combined with the development of commercially attractive business models. The reality of the medium term economic environment is that mandated requirements or targeted subsidies that raise bills will only be accepted to a limited degree. We will conduct research into effective policy tools, changes in industry structure and new, commercially viable business models that will encourage a sustainable industry that is able to deploy new approaches to heating and cooling across a wide range of markets. To this end, the group of industrial partners will actively participate in and help to deliver our research. An understanding of end use behaviour across varied groups of consumers and markets will be included to ensure we can maximise adoption and impact. Behavioural science considers why consumers make certain choices, what influences levels of consumption, where rebound effects occur, etc. Experiment-based research will determine how solutions are fit for purpose with regard to consumer needs and this will engage consumers in the centre’s work. We will also study what capabilities will be needed for successful commercialisation and market growth, e.g. workforce skills for implementation and maintenance, IT capabilities for effective management of the integrated solutions and developing the supply chains to serve this major new market. Delivery temperature of heating or cooling is a major technology determinant that cuts across applications. Thus we have defined three Delivery Temperature Work Packages (DTWPs). The Work Packages are not compartmentalised and that members of the research team will have an input to all of the DTWPs. Each DTWP will have a number of individual sub-tasks or projects within it that will evolve and adapt with the Centre and will vary in duration and start date. WP0 Dissemination / Network: The i-STUTE Centre includes a major dissemination network based on a successful EPSRC funded network SIRAC (Sustainable Innovation in Refrigeration Air Conditioning), tthe new combined Network is SIRACH (Sustainable Innovation in Refrigeration Air Conditioning and Heating). The aim is to increase the quantity, efficiency and quality of research and technology transfer in the industry sectors by raising the innovation level and encouraging the industry to take a more active involvement in academic research. WP1 Economics, Policy and Behaviour (EPB): Our aim is to develop innovative technical solutions that firstly appeal to consumers and secondly reflect the business models needed to bring them to market. Bob Critoph, School of Engineering, University of Warwick. David Elmes, Warwick Business School, University of Warwick. Phil Eames, University of Loughborough. Graeme Maidment, London South Bank University. The Advisory Board provides a strategic overview. 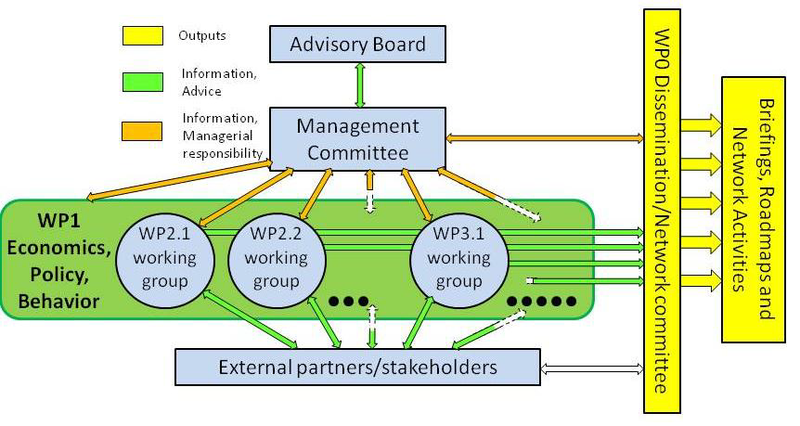 It consists of the Management committee plus Industrial, NGO, EPSRC and Government representatives.